Raisin Bran Extra! is exactly what the name promises. It's Raisin Bran with extra stuff and it's pretty good. The cereal consists of traditional Raisin Bran flakes, raisins, dried cranberries, almond slices and little yogurt clusters. There's not quite as much extra stuff as the spoonful on the box would have you believe, but there's plenty enough to realize that this is Raisin Bran with a little something "extra". The yogurt clusters add a tiny crunch to the cereal, which is especially nice once the milk has exhausted the flakes of their crunch. The clusters are sweet and have a mild vanilla flavor. But even with the added sweetness, those inclined to sprinkle a little sugar over regular Raisin Bran will probably want to do the same with this cereal. The only think I'd like to see different would be the addition of more almond slices. They add a nice flavor to the bites that have them, but those bites are relatively rare. Nutritionally speaking, this cereal is very similar to original Raisin Bran with the sad exception that the new cereal has 1.5 grams of saturated fat - compared to the original's 0 grams. On the flip side, this new cereal has 13 grams of sugars - compared to the original's 19 grams. Both cereals offer 7 grams of dietary fiber. Given the choice between original Raisin Bran and Raisin Bran Extra! - if they were same price for the same amount - I'd buy the new cereal. I'd don't know if you'll like it as much as I did, but if you like original Raisin Bran at all, you should definitely give this new product a try. What do you think of Raisin Bran Extra!? I wish they still had this. It was the best cereal of my life! Loved this cereal! It was my favorite! Please bring it back! I absolutely love this cereal! I wish there was some way to convince Kellogg's to bring it back! Raisin Bran Extra... where are you? I miss your great taste! 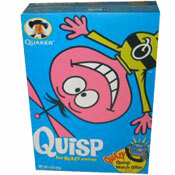 Awesome cereal and now it's discontinued! My absolute favorite for 2 years despite the price. Kellogg's - PLEASE BRING THIS BACK! Why can't I find this cereal anymore? I'm gonna be so sad if it's discontinued. Raisin Brad Extra cereal is off the hook. I enjoy the taste of the yogurt cluster, almonds are a great addition. It is my number one cereal. My only problem is I can not find it any more. I live in St. Louis Mo. I am willing to purchase this cereal by the case if I have to. Love it but unable to find it. I would gladly buy it online but couldn't find where I could do that. I LUV them! Can't find them anywhere, though. My 3-yr old even asks for the cereal with the raisins in it. I fell in love with this cereal and now I cannot find it on the shelves of any of the stores around here! I am very disappointed! I absolutely love this cereal. It is my new favorite! My 10 year old son picks this over his normal "sugary kids cereal." I can not find it anywhere anymore! I'm so bummed, I used to buy it from market basket and they stopped carrying it then found it at Wal-mart, now they never seem to have it! Anyone know where else to buy it? I'll buy it by the case full! It's delicious - and the people complaining about sweetness need to realize that they are drugged with sugar their whole lives and could stand to lower their daily fix. I mean, sweetened raisins? That's like dipping a jolly rancher in maple syrup. Raisins are sweet enough. There is no need to smother your day with sugar. 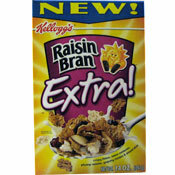 I love Raisin Bran Extra! It is great and I eat it for lunch and dinner sometimes too. I do agree that it is a little less sweet because of the normal unsugared raisins but that is an easy fix. The almonds and cranberries were an excellent addition. This cereal is the bomb. I really enjoy it. I love, Love, LOVE this cereal! This is DELICIOUS with vanilla silk! I like the Raisin Bran Extra is now my favorite cereal. Walmart in my area is having a hard time keeping it on the shelf. This is an excellent new cereal in the Raisin Bran line, and I actually much prefer this over the regular version. The almonds and yogurt clusters are an excellent addition, hopefully they will make the boxes bigger so the price per oz. will come down a bit. Definitely worth a try, I will be going back for more! Where did you guys find it? Gave new Extra a try. Flakes were soggy almost immediately. Won't go back for more. The dog even would not even eat the flakes. I loved the clusters! I was expecting them to be stingier. Kind of like Basic 4, but slightly better and slightly more expensive. One of my favorite things about original Raisin Bran is the sweetened raisins. This cereal seems to use regular raisins. I think that is why this cereal, overall, seems a bit less sweet, even with the addition of the yogurt clusters. If you're watching your sugar, this is probably a better pick for you. I like it because even with an extra teaspoon of sugar added, you'll still get added benefits from the almonds and cranberries.